True fact: every rabbit lives their whole cute life. What are Antijokes? Anti Jokes (or Anti Humor) is a type of comedy in which the uses is set up to expect a typical joke setup however the joke ends with such anticlimax that it becomes funny in its own right. The lack of punchline is the punchline. We've just released huge update to the iOS app! Now, access all your favorite text and photo sites like Anti-Joke, DIYLOL! A few things didn't make the original cut (like comments) but they'll be back soon. Best of all, the app is now FREE! Get it here. NEW ANTI-JOKE BOOK! 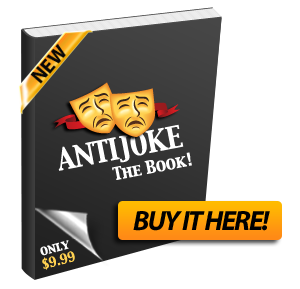 Now that we've resolved the printing issues with our publisher, check out the BRAND SPANKING NEW Anti-Joke Book! -just kidding. I know she died at a young age. Excuse me, does this smell like chloroform to you? Clarkson watching someone drive a lada and being offered to ride one. ©2008-2019 Anti Joke. All rights reserved.